Spiritual anxiety is not, in and of itself, bad. It is essential. For those of us thoughtful, reflective, questioning, sensitive souls, we often find it at one or more times in our lives. And when we’re in it, it is difficult. It is hard. Our whole world is flipped upside down, spinning, and standing still all at the same time. It is a time of insecurity and uncertainty. And it is good. I need to be busy. My brain needs multiple projects and ideas spinning around in order to feel stimulated and content. I do not tolerate boredom well. The problem, however, comes that I do not tolerate overstimulation and over-commitment well, either. And the window of tolerance between boredom and overstimulation seems awfully narrow. The real problem with multipotentiality isn’t the “multi-“ part, it’s the “potentiality” part. 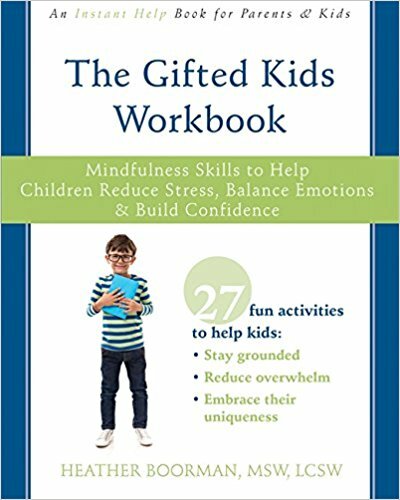 Look at any list of “gifted traits” and you’ll see intense emotions, sensitive, empathetic, strong sense of justice and right and wrong. So many of our kiddos can see bigger and feel bigger and this leads to them having an acute sense of compassion and understanding of the many injustices of our world. To help our kids move from empathetic, understanding people, to people who may actually change the world, they need our guidance. Here are 7 steps that may help. 1. Help them regulate their emotions. Being aware of injustice, pain, and suffering triggers a multitude of intense emotions. Some kids feel intense sadness or fear. Others feel anger or hopelessness. It is crucial that we, first and foremost, help our children identify, express, and manage these emotions. When our bodies and minds are hijacked by emotions, our actions become ineffective. It does not help homeless animals find care and shelter if we are overwhelmed and crying in the corner. Angry outbursts do nothing to increase access to potable water around the world. Of course, your children will feel these emotions. If they didn’t, they wouldn’t be motivated to help. But, they need us to teach them the skills to feel their emotions, allow space to get them out, and then productively channel this emotional energy toward solutions. 2. Transform Guilt to Gratitude. As children become more acutely aware of their privileges and compare their lives to the lives of less privileged people, the emotion of guilt can often be triggered. Guilt can be a helpful emotion when it results from specific behaviors an individual has done which have been harmful. I feel guilty when I yell at my children. That guilt motivates me to better regulate my own emotions so I yell less often. However, guilt is misplaced when it results from something in which we’d had no control. Feeling guilty for missing an important meeting because you were ill is futile. Feeling guilty that you happened to be born into a stable, middle class family serves no purpose. Help your children transform any guilt into gratitude. It is possible to both appreciate your own life’s advantages and understand that others do not have these same advantages. Not only is it possible, but to be of any real help in correcting our world’s injustices, it is necessary. Only when we appreciate our privilege can we fully use it to advocate for the underprivileged. 3. Listen to Them. Kids’ voices can easily be dismissed or minimized. Generally, because they bring up huge, complex issues at the least convenient times. My mind was not prepared to discuss what it feels like to die with my 3 year old as I was driving through a snowstorm. Nor was I prepared to discuss the causes of food insecurity while checking out library books. It is far easier to give a short answer or an “I don’t know” or “You don’t have to worry about that” than it is to actually listen, validate, and engage in deep, critical thinking. But, our kids need it. It does little to ease their anxieties or compassion to say, “you’re too young to worry about that” or “that’s for adults to think about, you just be a kid.” We need to actively listen to their thoughts and concerns. We need to help them find answers to their questions. If we quiet their voices by not listening, it won’t actually quiet their concerns. They’ll only be left to deal with them on their own without adult guidance. That said, it is also important to teach them the appropriate times and places to have these conversations. So, as your child brings up homelessness while you’re on the phone, tell them they’ll have to wait, but then come back to the conversation when you’re able. 4. Provide Reassurance. Our kids often have amazing imaginations. Which is great. Until it isn’t. Their brains can identify a real need or concern in the world, and then their imaginations can run wild with it. They can be consumed with imagining what it’d be like to actually be homeless. They can imagine that the world will end in 5 days due to global warming. They can vividly picture the spread of a fatal illness and the death and destruction left in its wake. We need to help our children rein in their imaginations and provide logical reflection to their concerns. 5. Help them Narrow Their Focus. A child who notices suffering will notice lots of suffering. A child who notices injustice will see injustice of all types. They will be concerned about healthcare and the environment and animals and race relations and housing equality and free trade and child slavery and mental health and, and, and . . . This becomes overwhelming. It is not only okay, but necessary, that we all choose a small amount of issues for which we will be strong advocates. We do not have the energy, stamina, or ability to work to change every wrong that is in the world. We have to choose our focus and trust that others will focus on the other things. Of course, we can still take small steps to be responsible, but we must be good stewards of our energy and skills. I will recycle, but I am not skilled or passionate enough about the environment to take it on as my “issue”. Instead, I will focus on promoting mental health and relational well-being. I will invest my energy and time into that and trust that others of you will be focusing on healing our environment. 6. Help Them Define Action Steps. Truthfully, we can feel extremely helpless when we face our larger social issues square in the eyes. Combating childhood cancer can seem impossible. Encouraging acceptance of neurodiversity seems daunting. The most solid way to combat feelings of helplessness is to find a way to help. Help your child identify their larger goal and then smaller steps they can actively do to reach that larger goal. Think of questions or obstacles they might not have thought of and help them find solutions. 7. Believe in Them. They need you to have confidence in them. They need you to be their cheerleader. They need you to reassure them that they are loved and worthwhile whether their solution or project is “successful” or not. Give them the courage to go out and make a difference. Our children are the innovators. They are the idealistic dreamers. And they can be the world changers. Looking for more ways to support your child activist? Check out the other posts on this topic at this month's Hoagies' Gifted Blog Hop! The ability to identify someone else’s emotions and the ability to identify and regulate your own emotions are essential to living a life with any semblance of wellness.